Dr. Foker has just come out of surgery with his coffee mug and told us that Aidan's surgery went well and he is reconnected to his traction sutures and has been making good progress so far. 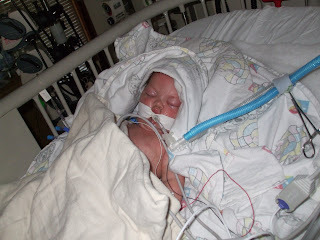 He was unable to find the leak in Aidan's esophagus but it may be too small to fix or has healed itself. Aidan will get Surgery 3.0 at some point next week for Stage 2 (Repair). Kirsti brought Aidan up to the room and told us that he did get some blood products because his hemoglobin was pretty low when he entered the OR. She said that everything looked really really good inside and that he is pulled very tight right now. His chest tube is back in as is his Foley catheter, hopefully only for a few days again. She mentioned the biggest holdup was trying to get a arterial line for his blood pressure but Aidan being his normal self decided to be impossible for over an hour until they finally gave up.